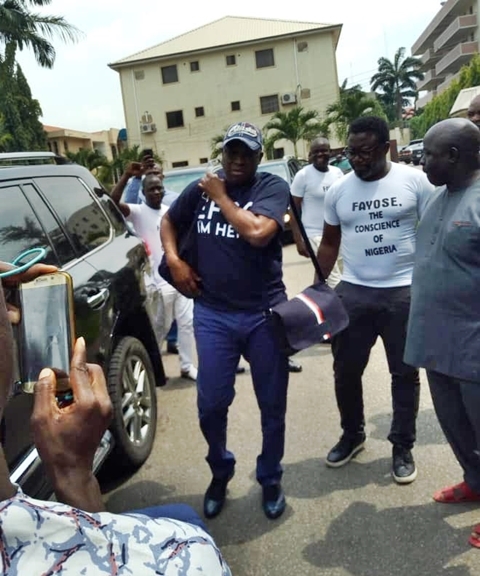 Barely 24 hours after leaving office, the immediate past governor of Ekiti State, Peter Ayodele Fayose, on Tuesday, honoured the invitation of the EFCC in style. 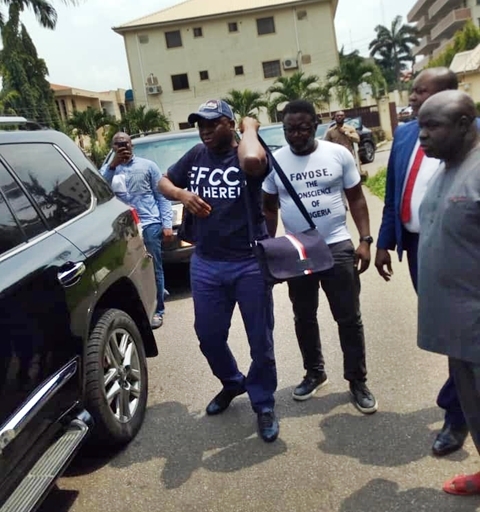 Former governor of Ekiti state, Ayodele Fayose, on Tuesday, arrived the office of the Economic and Financial Crimes Commission (EFCC) in Abuja, after he had earlier notified the EFCC that he will make himself available immediately his tenure expires. 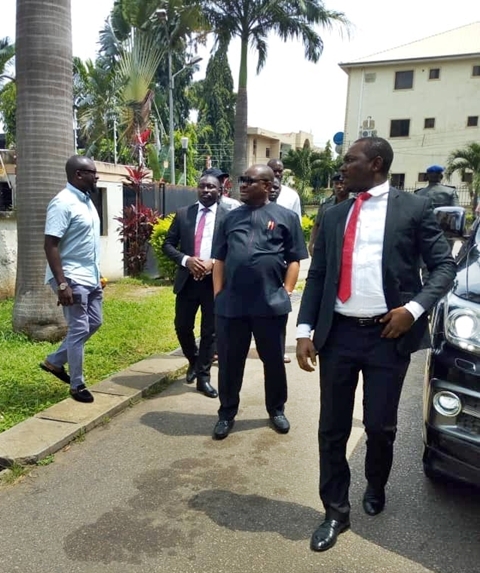 The infulential politician was accompanied to the anti-graft agency’s office by governor of Rivers State, Nyesom Wike, former Minister of Aviation, and Femi Fani-Kayode, a Senior Advocate of Nigerian, Mike Ozekhome, and others. 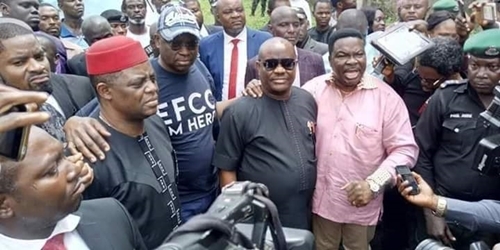 The shout of Oshoko rented the air from his supporters, who trooped out in their numbers to EFCC office, as the former governor alighted from the Toyota Land Cruiser he rode with Governor Wike. 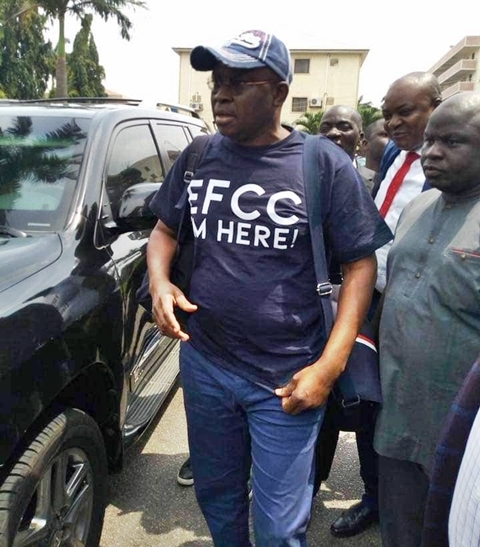 The governor was captured on camera wearing a black t-shirt with the inscription “EFCC, I’m here”, and was also spotted with a bag filled with his clothes. The EFCC had after the July 14 governorship election in Ekiti, hinted that it would investigate the integrated poultry project of Fayose’s administration, and filed the N1.3bn fraud case against Fayose in 2005. “The parri is over; The cloak of immunity torn apart, and the staff broken. #Ekiti Integrated Poultry Project/Biological Concepts Limited N1.3bn fraud case file dusted off the shelves. See you soon,” EFCC had tweeted on its official handle, which was later deleted by the anti-graft agency.